Android is the most popular platform for mobile devices like phones and tablets across the world with billions of user base and millions of new activations per day. There are more than 200 countries (dependent and independent) with people speaking various languages. All of us like to have the user interface and input language of our device to be in our native tongue to which we are so innately connected. Since it is not possible for any OEM to put all languages in every device universally, they generally divide the world into regions and countries and offer languages and connectivity options depending on that specific region. With the growth in technological advancements, the vast world has also grown into a smaller place with people of one country live in other countries. To address this issue, most OEMs ship their devices with some most spoken languages pre-loaded. However, under your Android device language settings you might not be able to see them all because they are hidden by default. English, being an international language, can be found in all devices but the case might be different with other languages like Spanish, Arabic, Chinese, Thai, Russian, Portuguese, German, Italian, French, Dutch, Greek, Indonesian, Polish, Serbian, Swedish, Turkish, Vietnamese, and so on. If you have installed a firmware meant for some other country/region on your Android device, you may or not find your language in it. There are no separate language packs available for users that can be downloaded and installed. It is here that the present tutorial might help you. Today, we’ll see how we can enable the hidden languages on Android devices from some major OEMs like Samsung, HTC and Sony. 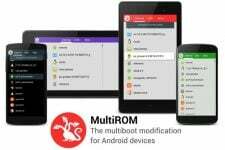 If you do not have root access on your Android device, you can still get your local language on it. Google Play Store has a very nice app for this. It is called MoreLocale 2 and is available for free. If More Locale 2 does not work for you try the following method that requires root access. Please note that the procedure described below may not work on all Android devices on any OS version. It has been found working on most phones with ICS and Jelly Bean. We do not guarantee that it’ll certainly enable the language of your choice. The language you want to enable must be there, though hidden, on your phone’s firmware. A rooted Android device from HTC, Samsung or HTC. 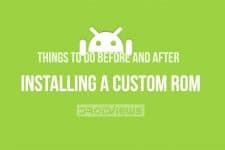 If you have not yet rooted your device, visit our rooting tutorials section. Notepad++ installed on your computer. If you do not have it, download it from here. Important: Backup your current ROM via CWM or TWRP before proceeding. Open the root file browser app and grant it Super User access if prompted. Now go to “system/customize/CID/” directory and look for a file called “default.xml”. Now tap and hold the “default.xml” file and copy it your phone’s internal or external SD card storage. Exit the root file manager app and connect your device to PC using USB cable. Copy/paste the “default.xml” file to your computer. Now right click on this file and select “Edit with Notepad++” option. You can see that “default.xml” has entries for three languages: English (en), Spanish (es) and French (fr). What you have to do it to edit the extend the language list with your desired languages. Below is an example of a modified “default.xml” with more than 100 languages enabled. You can copy and paste the code for your desired language in the “default.xml” pulled from your device. Then add the “<item type=”boolean” name=”XX_XX“>yes</item>” line with your language code to the original “default.xml”. Now save the changes and close the default.xml file. Copy it to your device, open root browser and navigate to the file. Tap and hold the “default.xml” and copy/paste it to the “system/customize/CID/” folder. Replace the original when prompted. Now exit the root file browser app and reboot phone. Open your phone’s Settings, go to Language and you should now see your language in the list. Select and save changes and enjoy! 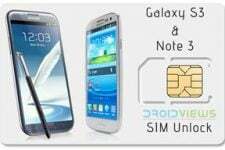 If you have a Samsung Galaxy smartphone or tablet device, you need not go through the drill described above. Thanks to the famous developer Wanam who has made an app that enables languages on Galaxy devices very easily. As stated above, the app requires root access on your phone/tablet to do the magic. Also, your device must be on official Ice Cream Sandwich or Jelly Bean firmware. I tested it on my Galaxy S3, S4 and Note 10.1 and it worked like a charm! Note: Please note that the app does not currently support Galaxy S, Galaxy S2 and all US variants (T-Mobile, ATT, Verizon), etc. Download and install the Language Enabler app by Wanam from the Google Play Store. Open the app and uncheck the languages you do not want on your Galaxy device. Now tap/press the back soft button and select Save when prompted. The app will then ask you to reboot the device to apply the changes. Select “Reboot now”. When your device boots up, open Settings> Language and input> Language. Here, you’ll see your selected languages in the list. Just select your desired language. 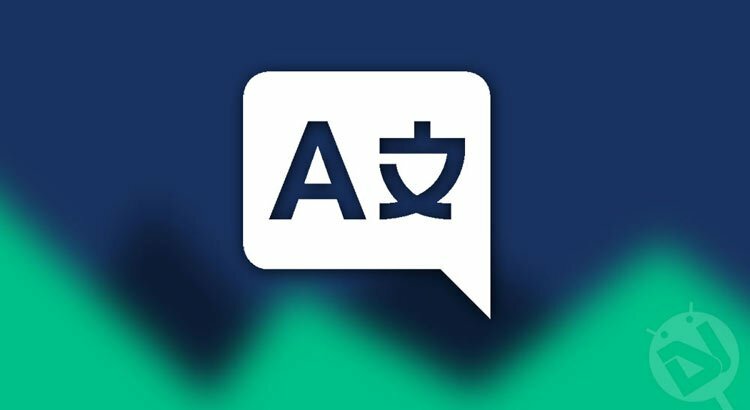 I just hope that this tutorial will help all those people who want to see their native language for device UI and keyboard input. Try them on your phone or tablet and do not forget to share your experience with us. It really helps us improve and come up with more articles like this one. You can find more useful tips and tricks for Android devices on DroidViews by clicking here. Note: The language enabling tips given above might not work on the US variants of Android devices. 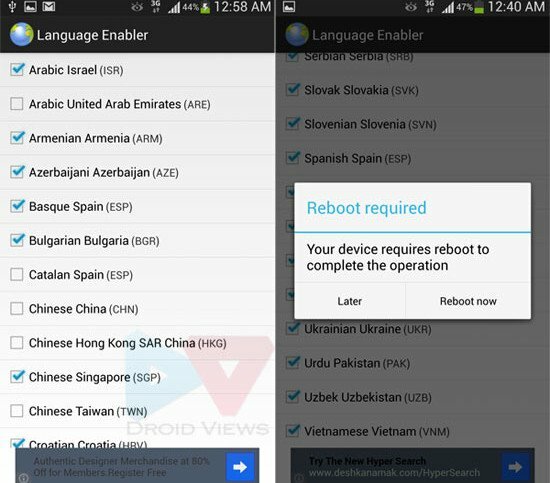 Rooted an AT&T Samsung Galaxy S5 with 4.4.4, Language Enabler could NOT show any languages besides the half-dozen that were already available. Since it’s a locked bootloader, Cyanogenmod isn’t an option. These apps and tips don’t work on AT&T and Verizon devices. Trying to add Chinese language to Note 3, please help? I have Vodafone Smart 4. All those apps for adding locales can change only about 25 – 30 percent. Rest still not changed. Any other ways to add more locales? WKarlsson I guess it will. Hi, I’m thinking of buying the Samsung note 10.1 2014 edition, and I was wondering if “http://d-h.st/WSE” will work on that device? Hi. I’m having cm 10.1.3 on my galaxy note 2 and i want punjabi language in it..please could you help me out what to do or set custom locale. ? Hi, this didn’t work for me. I purchased a Samsung Galaxy P1000 in New Zealand (languages available are: UK English, US English, Vietnamese, Chinese, Japanese and other Pacific island languages), and I gave it to my mom, who is going back to South America. We need to install the Spanish language and it does not work. I don’t even get the screen you show above. Help, Please! Hi! I have an S4 that I’ve bought in US, but I live in Brazil and cannot change the locale setting to enable portuguese. Does any of this tips help me (before I try them)?